Chances are by now you’re well aware of the horror fun to found in The Cabin in the Woods (and if you’re not, what gives?) 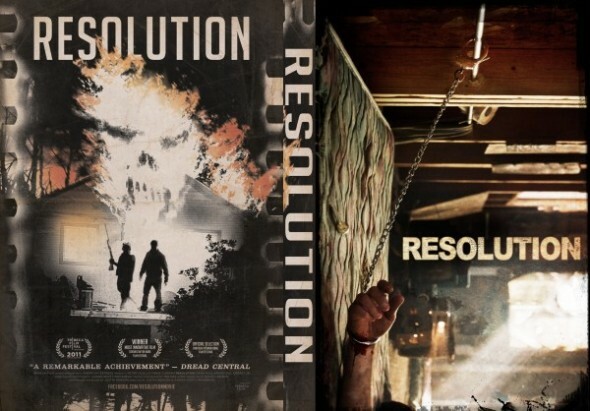 For a lesser known take on the “cabin” premise, check out Resolution, which is finally released to DVD this week. Much like the blockbuster, Resolution takes a self-aware approach to the horror genre, reworking popular plot conventions and metaphorically bringing the horror audience into the narrative. It also brings more true creepiness to the party, while still managing a healthy dose of humor, and tipping a hat to the art of scary storytelling with nods to films as varied as The Blair Witch Project and Cache. And speaking of Michael Haneke’s brilliant, simmering thriller Cache, definitely see that movie. Though it’s an entirely different experience, Haneke’s work shares a sense of dread that comes from the knowledge of being surveilled. Haneke develops a looming, paranoid foreboding, a sense of silent menace the characters can’t shake. You’ll have trouble relieving yourself of it, too.